In just about any profession, there's a question of "who's the best?" Who is the best copyeditor? Who is the best dentist? Who is the best soldier? Who is the best wizard? In The Arcane Arts, you look to answer that final question by engaging in a wizard's duel with your opponent. Only one of you will be walking away, so you'd better collect together your best spells, powered by your runes. But beware, as your own runes can potentially be used against you. That's the story behind the game, which is up on Kickstarter now. 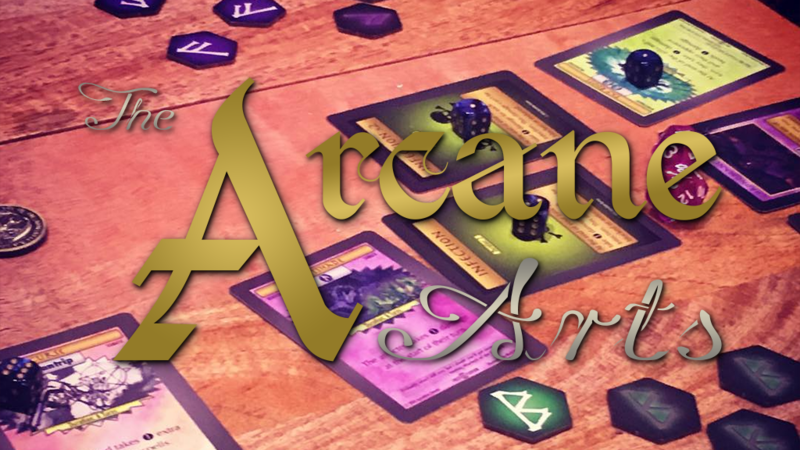 The Arcane Arts is a game of witchcraft and wizardry that pits you and your opponent in a duel to the death. Players take turns attacking and casting spells at each other until only one remains. Each player has their own deck of magic spells, ancient relics, and powerful runes which they use to do battle. Featuring a unique energy system, players begin the game with full power and can regenerate their magic power each turn. But beware, the runes have an owner but no master! Your opponent may drain your runes to cast their spells at you!?? Will you outwit your opponent? Turn their own strengths against them? Hit them in the face so hard that you knock all the blood out of their body? The choice is yours! Pick up a Spellbook and throw down the gauntlet today! The Kickstarter is a bit below 25% funded, but there's still 24 days left to go.